=> See Activities for information about our pricing, payment, and refund policies. And about personal insurance requirements. We have 2 lodging options: the Posada Rustica (our main guesthouse) and Casa Central (our lodge). The Posada Rustica has 6 bedrooms and can host up to 12 - 15 people. It is located in the middle of the farm. The 2nd floor of the Posada Rustica has 5 bedrooms. 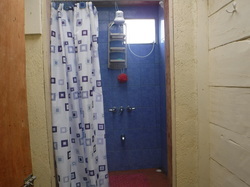 There are 2 shared bathrooms and 2 shared showers on the 2nd floor. Also the 2nd floor has a large balcony with rocking chairs and a hammock, and a view of the horse arena and stables (El Establo). 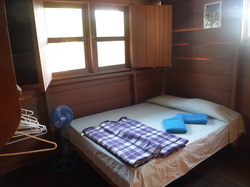 On the 1st floor there is a bedroom with a double bed and private bathroom/shower. Also on the 1st floor of the Posada Rustica there is a large kitchen and dining and sitting areas. We have Wi-Fi, just ask for the code. Our dogs Perro Perro, Frankie, Coco, and Dovie watch over the Posada Rustica. For "Bed and Breakfast" 21,000 colones/person single occupancy ($35); 18,000 colones/person in a shared room ($30). Includes option for guided visit to nearby farm areas and horse stables. Casa Central, our "lodge" is about 5 minutes walk from the Posada Rustica. 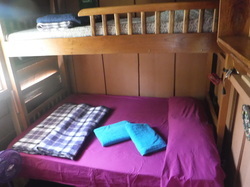 There is a double bed and a sofa that can be used as a single bed (there is also an additional spare mattress). There is a complete kitchen and very nice bathroom/shower. Outside there is a large patio with rocking chairs and a hammock; and amazing views. Casa Central is perfect for persons seeking more privacy. Maximum 4 persons. Note: we have tents, mattresses for extra persons. 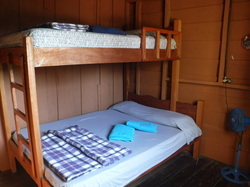 27,000 colones ($45) for day/night (no meals or activities included). Discounts are available for extended stays. Ask us about prices for meals (and to purchase farm products like eggs, cheese, tilapia), and/or activities. Contact us today to book your stay on Finca Rio Perla!